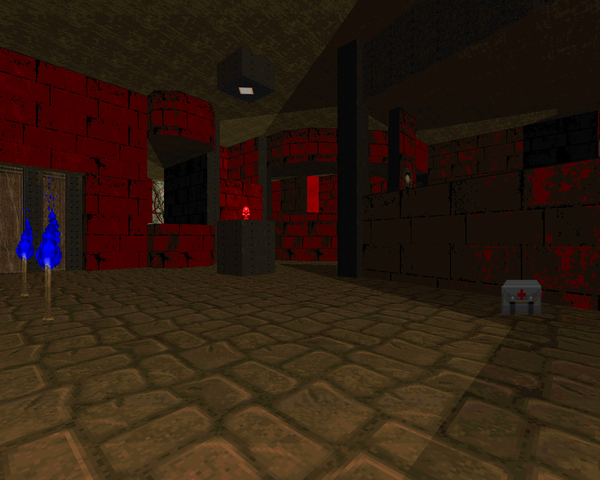 Richard Wiles released ten Doom II maps in 1998, comprising the DICKIE series. 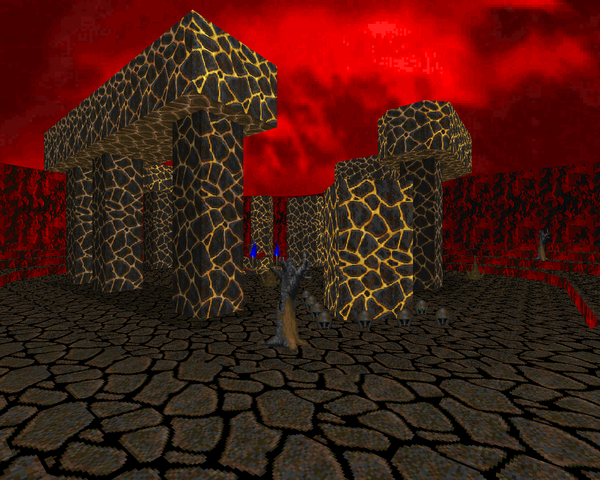 DICKIE06 is, uh, the sixth map in the set, given the title "Hell Henge", which is quite appropriate. Back in DICKIE01, you showed up on an alien planet to find it full of demons. You bust a few heads, find yourself fortunate enough to dispatch the commander, and then spend the rest of the levels traveling the rest of the planet, eliminating the remaining pockets of monsters so that your victory is complete. 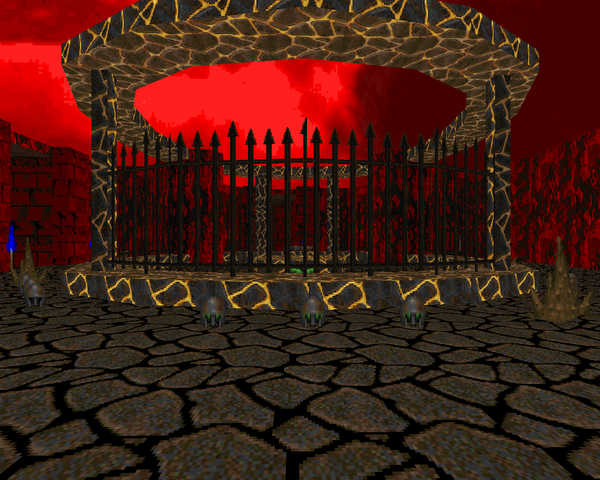 Hell Henge is quite the departure from previous maps in the series, with a supernatural color scheme worthy of "The Spirit World". Most of the level is cherry red brick and stone, but the rarely-seen yellow-cracked rock is used to great effect. DICKIE06 is brutal. 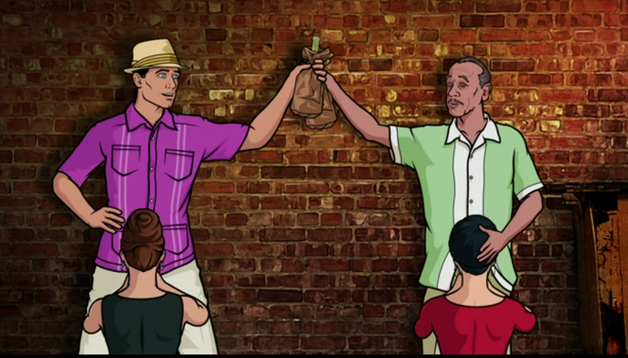 Nowhere is this more apparent than the tunnels immediately following the beginning. It's a series of linked pits full of magma with the connecting doors raised out of the muck. They're your only safe place to stand as you fight off roaming hell knights and several dozen lost souls that keep popping out of the flames. Other tough fights include a difficult to clear horde of imps that warps in by the red key and the precarious fight leading to said teleport ambush, which involves narrow walkways, a bunch more lost souls, and a few hell knights for good measure. The rest isn't nearly as challenging, though if you're not careful, you could end up eating a few revenant rockets after getting caught on the things surrounding the eponymous Hell Henge. Hell Henge is a very straightforward map when compared to "Waterworld" (DICKIE05). There's one odd moment where you have to take the teleporter to the plasma rifle alcove twice, which is made somewhat interesting by more lost souls in the room itself, but progression is quite linear. I do like the ambushes sprung on you in the final room, which require some finesse to dance around. My only gripe is that opening lava maze. I think it's too hard on UV given the damage the floor will do when you're ducking the opposition (chiefly the flying skulls), but it's not impossible. I really like the look of this level. Wiles added a new custom texture here, some arrow-topped fence that helps to give the map some flair, not like the glowing rock structures aren't distinctive on their own. Granted, a little bit of alignment on some of the rougher edges would help further smooth things, but that's pretty much the only real criticism I've had of Wiles's aesthetics so far. 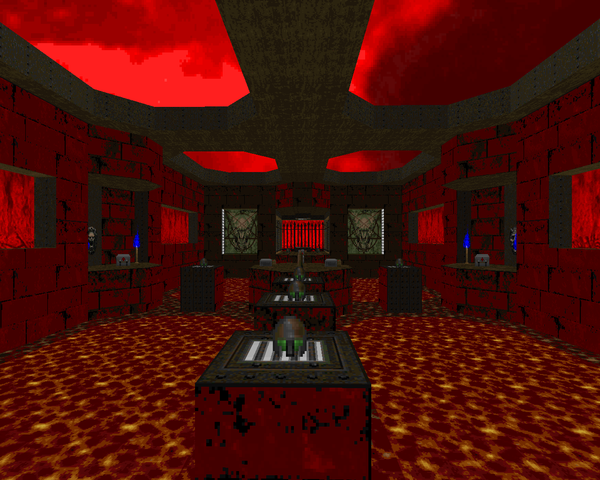 You should give DICKIE06 a try, especially if you're wanting for Hellish Doom II levels (and don't mind a challenge). Actually, let's not beat around the bush. Just play the whole DICKIE series.